Before we get onto the challenge we have something to share with you. Do you remember the beautiful PrettySweet CD? Well, Nikky has fallen in love with it all over again and re-mastered and brought up to date the images from the collection, and they are now available to buy as Digi Downloads. You can find them all here. We are sure you are going to love them as much as we do! Now, before we get to the challenge you MUST head over to the Polkadoodles blog this week for some really exciting news - the link is at the bottom of this post! So we would like to see lots of flowers on your projects, whether they are the main focus or added embellies. You have until 9th September to enter and the winner will be announced on 16th September, so lots of time to get your entry in. All we ask is that you follow the theme and the simple rules that can be found in the side bar. Let's see what the team have for us! Anjie - On my card this week the image is a old one from the Pretty Sweet CD remastered and brought up to date by Nikky Hall. You can now buy Amelia with Basket as a digi download here. The papers are from the CD. The image is coloured with my Graph'It Markers . The roses are made from the same papers. The dies I have used are from Sizzix. I have used a distress ink around the edges of the papers and added a black ink line. Crafting Vicky For this card I decided to let the blooms take over! And kept it super CAS!!!! Quite a big change for me. The image that I used is from Candy Doodles Collector's Edition. I used the image called Daisy Patch blue. 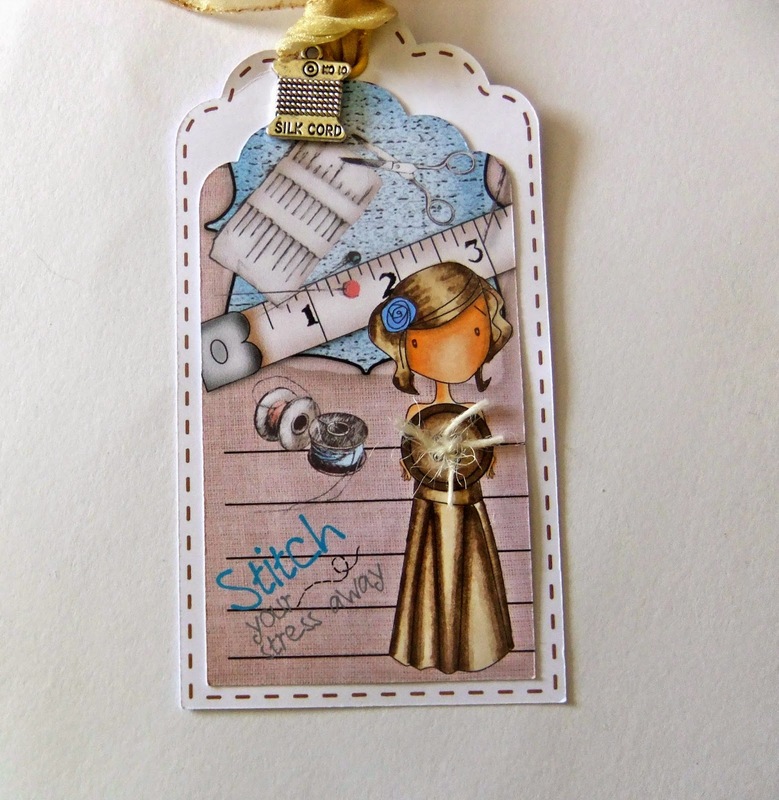 I just stamped a little French sentiment and added some bling and that's IT! Yvonne - For this weeks challenge I was going to focus only on flowers but then Nikky updated the girls from the 'Pretty Sweet' Collection......and there was just not way I could avoid using 'Amelia with Basket' which you can get on the CD Collection and she is also available as a single image in the Digiworld Downloadable section of the Polkadoodles Store. I coloured her with my Graph'It Markers. I cut the image out with a Tattered Lace die and used 'Tint of Ultramarine' pan pastels to soften the edges. The larger backing paper is from the Kath Bundle digi download and the forefront paper is part of the 'Pretty Sweet Collection'. The sentiment is also from the 'Pretty Sweet' Collection. The flowers and butterfly that I have used are from the 'Flowers & Leaves' Download Bundle. Wendy - Flowers, flowers everywhere! This week I have themed my card for a man . 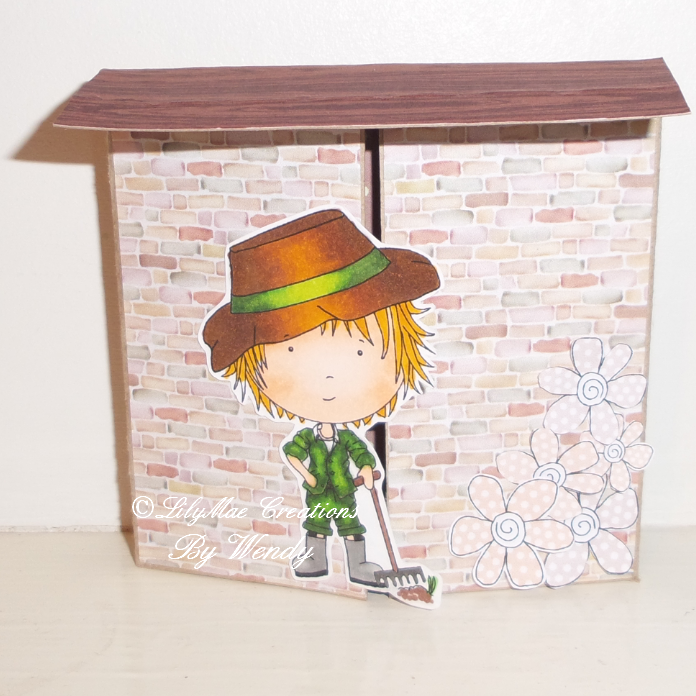 I've used the Gardener from Work & Play 2, as is the brick backing paper, which is made to look like a shed and the flowers are from there too. The image is coloured with Graph'Its. Patty i used the digi girl from Candy Doodles to make this lovely card...all papers are left over from differents PD collection like Cherryblossom Lane and Sugar Birdies. 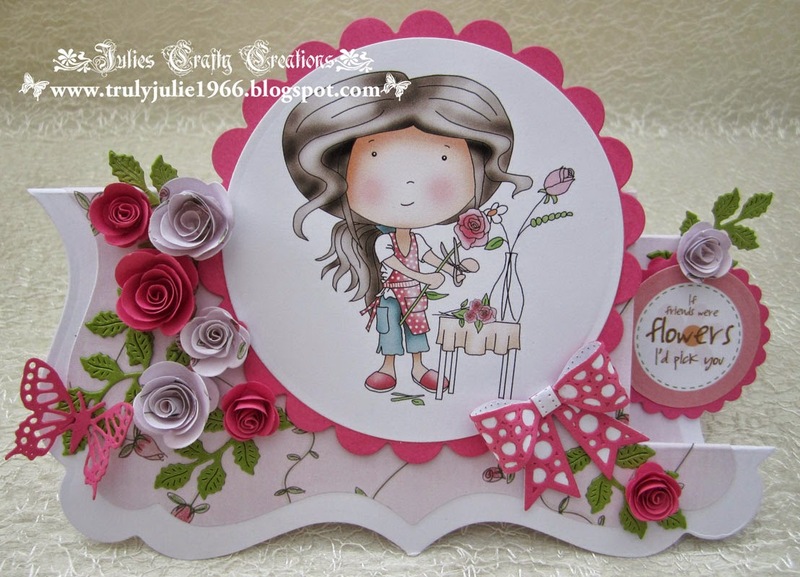 I use the negative side of i cut out to portrait Nelly and added the yellow flower with some purple doodle dewdrops and the fuschia lace on top to accent the whole card...what do you think? please email us HERE quoting DCwk34001wk31 to claim your prize of a 3 free digis. Don't forget to now hop on over to the Polkadoodles blog for the exciting news! Make sure you head over to the digi store this week - there's a ton of new digis added and they are all totally adorable! To enter the challenge you can make anything you like, from a card to a home décor item and anything in between and the challenge is all about blinging it up! You have until 2nd September to enter and the winner will be announced on 9th September, so lots of time to get your entry in. All we ask is that you follow the theme and the simple rules that can be found in the side bar. You do NOT need to use our products to enter but we'd love it if you do! You can see the winners of our last challenge at the bottom of this post! Crafting Vicky Wow I have to say that I love the idea of Pearls and bling! So much easier for a challenge lol. 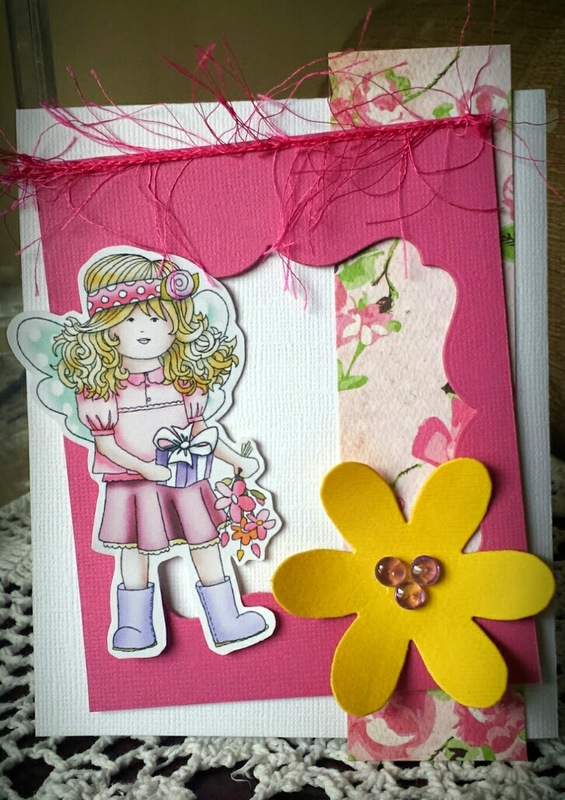 So had lots of ideas... and I ended up making a totally girly card for this challenge! I used the totally awesome Work and Play collection 2 for my card. I used the fabulous Ballerina and some great papers as well. You can't get more "girly" than this! Sharon - I love pearls but don't really do bling so have got my sparkle from glitter for this week's theme. 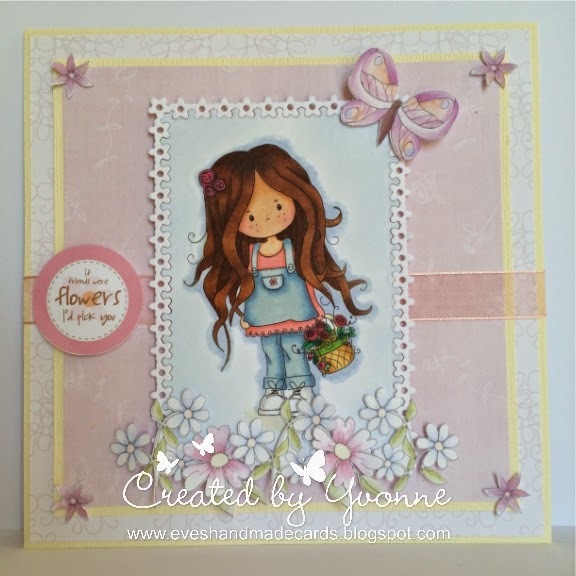 I have chosen the Sugarplum Daisy CD and used one of the toppers from the collection. Choosing colors from the topper I have used an aqua card and a purple dotty backing paper - Who knew these would go together! The border and sentiment are also from the cd. (I have colored the sentiment to match in with my color scheme.) Although they don't show so well in the photos I have put tiny pearls in the centre of the daisies in the pretty fairy's hand and fairy dust on her wings! larger purple pearls are on the corners and sentiment. Julie - I have made a diamond shaped card that can be displayed in the three ways...The gorgeous image I have used for my card is called Singin Sally and is available in the Polkadoodles Digi Store HERE, its also available on the Work and Play 1 download, which can be downloaded immediately so no waiting for a CD to arrive. 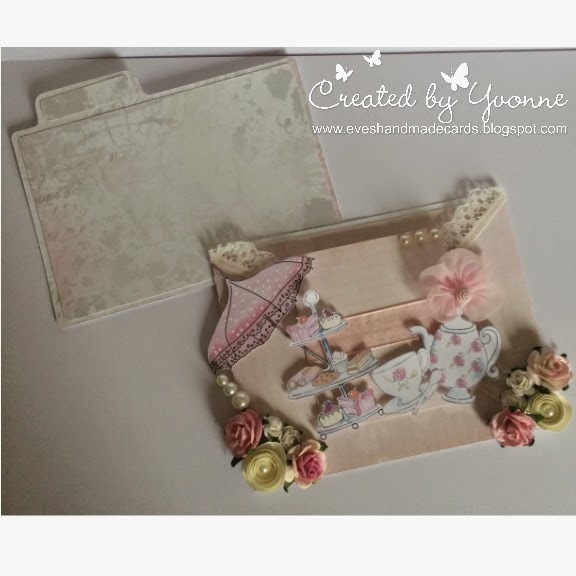 The pretty backing papers I have used are also from Work and Play 1 Download. 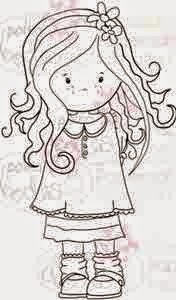 For my bling I have added pink and beige pearls to the corners of the image and added gems to the dots on her hair bow. 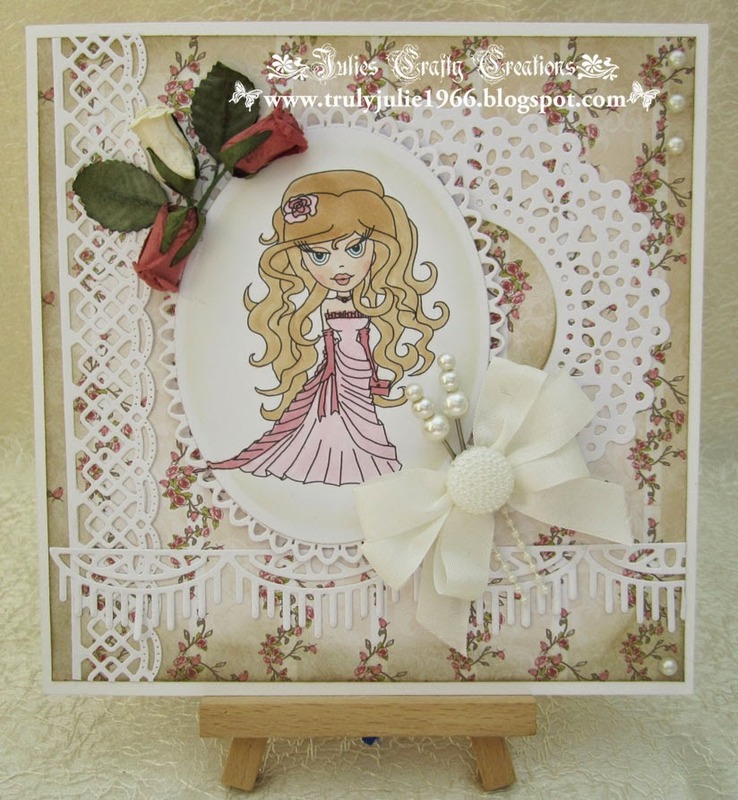 I have also added a pearl embellishment to the centre of the bows on each side of the card. Yvonne - Hi there! Well for a theme of Pearls & Bling, I had to use a wedding image. I chose to use Emma Canning's 'Bride' - now get this quick because it is about to be discontinued from the Polkadoodles Store but for now you can get it for 35p - that's THIRTY FIVE pence folks!!! I coloured her with my Graph'It Markers - the colours used are on my blog. I chose to use papers from the Rose Bundle papers. I added my ribbon, pearl swirls and bling for the finishing touches! Fantastic ideas here for you from the team, as always!! please email us at sales@polkadoodles.co.uk quoting DCwk33001wk30 to claim your prize of a 3 free digis. Well done everyone go grab your badges from the side bar - thanks so much to everyone who entered! You have until 2nd September to enter and the winner will be announced on 9th September, so lots of time to get your entry in. All we ask is that you follow the theme and the simple rules that can be found in the side bar. Before we get onto the challenge this week we wanted to let you know about all the new goodies we have in the store this week. Do you know we don’t just do Digis and CD’s, we also make lots of lush Clear Polymer stamps, and because they are clear stamps the prices are AMAZING! Go check them out HERE. We also have our own Die Cut sentiment sheets, Designer Cutz Design Sheets (all you need for one card on one sheet) and NEW Digital Cutting files for all your electronic cutting machines! So pop over and stock up on some new goodies before they are out of stock. The stamps are flying out! Stitching – Real or Faux. You have until 26th August to enter and the winner will be announced on 2nd September, so lots of time to get your entry in. All we ask is that you follow the theme and the simple rules that can be found in the side bar. please email us at sales@polkadoodles.co.uk quoting DCwk32001wk29 to claim your prize of a 3 free digis. Wendy - As Vicky returns form camping, I am off! So I couldn't choose a better image than the girl swimmer from Work & Play 4. All the papers are from there too, as are the flag embellies. The image has been coloured using Graph'Its. I added faux stitching using a Serif Craft Artist and pen round the edge. 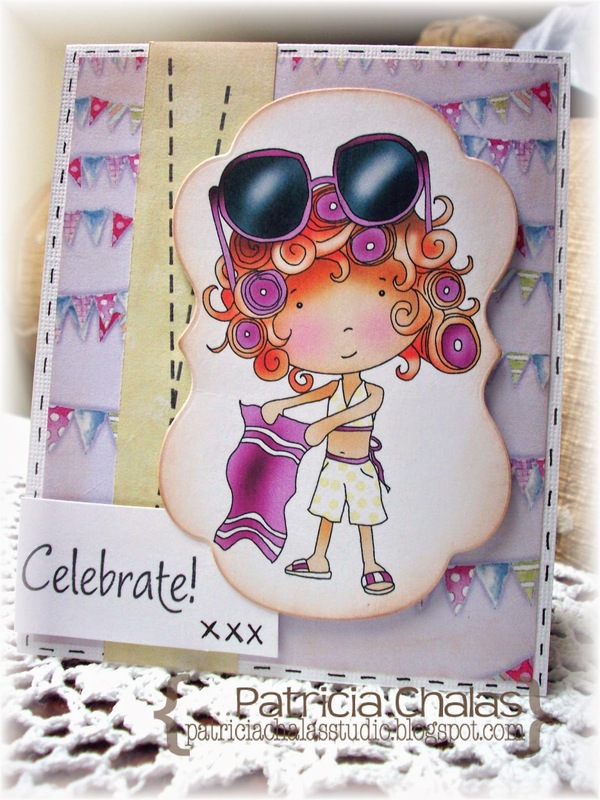 All the items on this card are from the Baby Boom kit, which is amazing and a bargain at only £2.99! 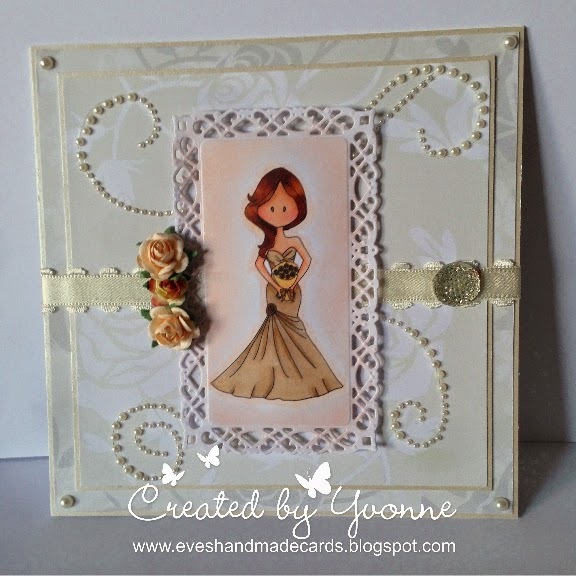 Sharon - I have used faux stitching on my card. I have made patchwork with 2 papers from the Cherry Blossom Lane CD but cutting them in to equal size squares and matting them on some green card and a 3rd paper from the disc. I have then "stitched" around the squares with a fine black pen. Maisie is also from the CD and I have colored her with Spectrum Noirs and fussy cut her before using foam tape to fix her to the card. As she has a pair of scissors in her pocket and ribbon on her ear I have then added some appropriate embellishments from the Picknix Cd collection and some pink dotty buttons from my stash. Yvonne - Hello there! Well I spied the new image in the Digiworld - Downloadables of 'Alyce Sewing' - and since the theme for this week is 'Stitching' - well it would have been rude not to use her, wouldn't it!? I also used two papers from the 'Tatty Easter' digi bundle which is FREE.......no excuse not to have this, you even get the Tatty Easter Image & embellies for FREE too. I coloured Alyce with Graph'It Markers - lushness abounds. I used a Tattered Lace die to cut her out and added some distress ink round the edges. Some flowers, pearls, lil bit of ribbon, job done! There is some 'faux stitching' around the gingham backing paper. Patty - I have used faux stitching on my card. I used papers from the Cherry Blossom Lane CD and Lady Caravan from the Work & Play 6, the colored digi....the Celebrate sentiment is from Stamp Doodles Set, I distress all the edges for the old feeling, i die cut her and distress the edge . 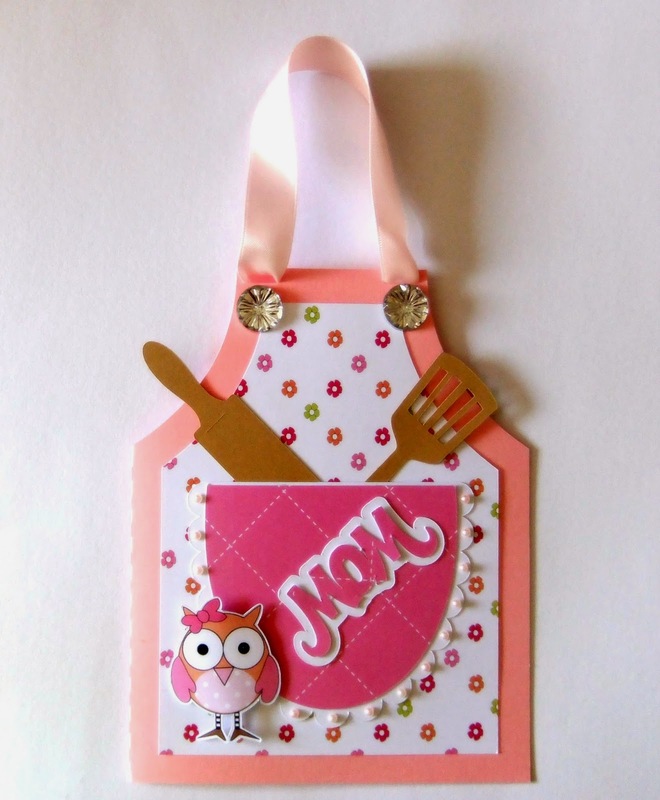 I love the outcome of this card and I will used it for a friends who's Birthday is coming up! Anjie - I'm sure you all know I'm a fan of faux stitching as I often do it on my projects, so this time I thought I would add some real stitching as well.I have used the Owl Always Love you download for all the elements on the card other than the sentiment. I have used a distressing tool around the edges of the card, paper and topper. I then got my mini sewing machine out to add the real stitching around the edges of the paper. As you can see it didn't want to play and sew so I ended up having to wind the machine by hand which has given a wonky line of stitching, but this kinda adds to the distressed look of the card. I then added the faux stitching around the topper with a white pen. Fantastic ides here for you from the team, as always!! The winner will receive 5, yes FIVE!! digi images from the (Digi Store) - have fun and we'll see you next week! 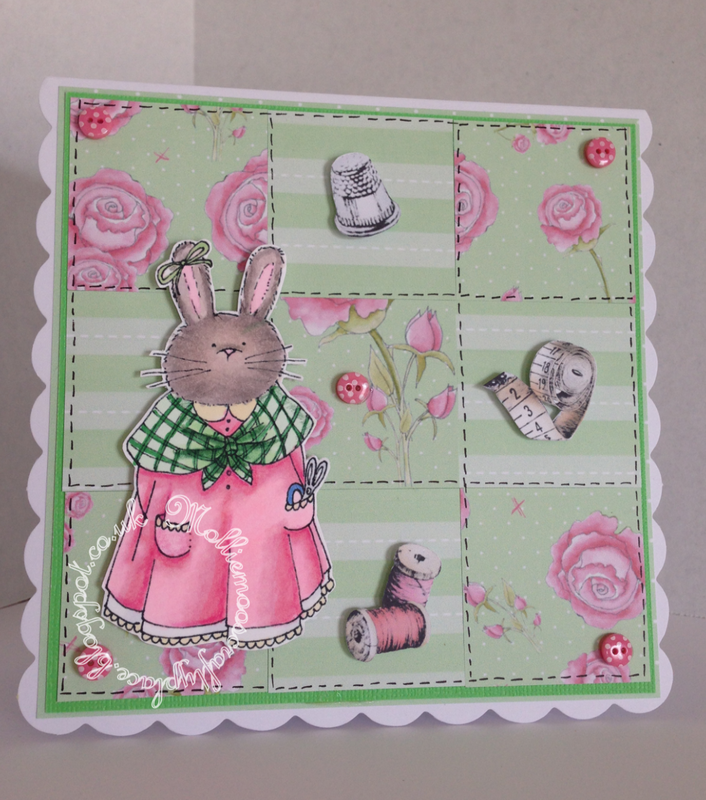 Did you manage to catch Nikky on Create and craft this week? If not, head over to the website to see our fabulous new products. You can find them all HERE. If you are not clear about what Shabby Chic means here is the Wikipedia definition for you. Shabby chic (pronounced: "sheek") is a form of interior design where furniture and furnishings are either chosen for their appearance of age and signs of wear and tear or where new items are distressed to achieve the appearance of an antique. At the same time, a soft, opulent, yet cottage-style decor, often with an affected feel is emphasized to differentiate it from genuine period decor. So we have taken that same definition and applied it to crafting. You have until 19th August to enter and the winner will be announced on 2nd September, so lots of time to get your entry in. All we ask is that you follow the theme and the simple rules that can be found in the side bar. please email us at sales@polkadoodles.co.uk quoting DCwk31001wk28 to claim your prize of a 3 free digis. 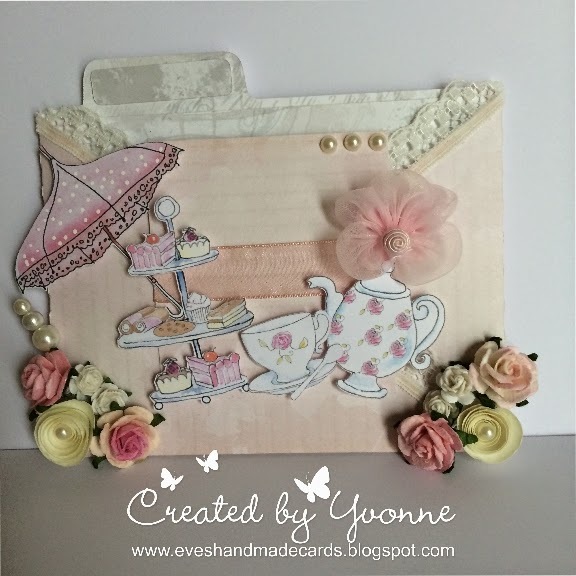 Wendy - I have loved this weeks theme, takes me back to my crafting roots! 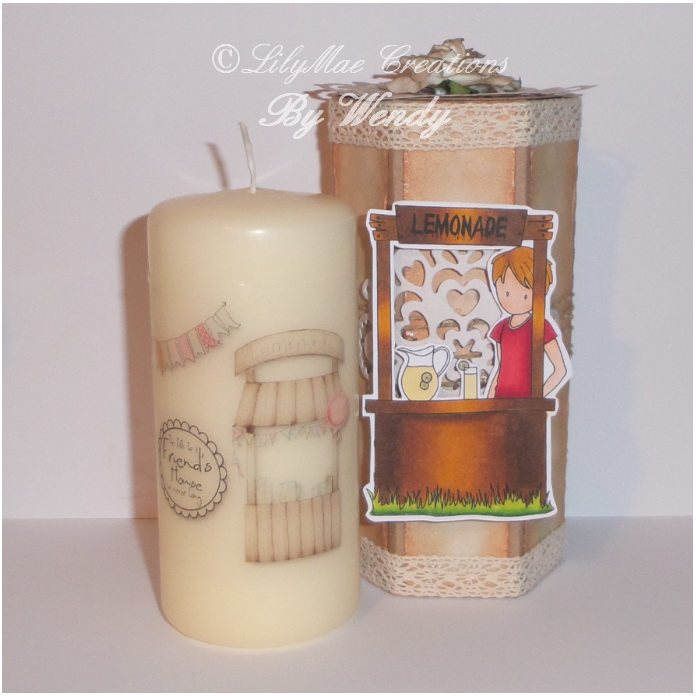 The main image on the candle box is from Emma Canning, Lemonade Sale and coloured with Graph'Its.The papers on the box and the images laid into the candle are all from Heavenly Garden on the Picknix Collection. Sharon - For this weeks challenge I have used only the papers from the new Work and Play 6 bonus collection to demonstrate how versatile these collections are. I have distressed the edges of the papers with my scissors. These, the doily and the lace were then inked with some distress ink. I used Kraft card to mat these onto and cut the leaves. I die cut the flowers and added buttons threaded with some burlap cord. The sentiment is from the same collection and has again been distressed with ink. Yvonne - Hello! Well Shabby Chic is not really my forte, but I think I did it and more importantly, I quite like it! I made a criss cross card and the papers I used are from the beautiful Rose Budd CD-Rom Collection - the papers in this collection are beautiful! I added a little bit of lace to the edges and I printed off some of the embellies from the Rose Budd for the focus of the card. A few flowers and some gems and I was happy with the effect. Hope you like it! Crafting Vicky - OK so here's another challenge that I dreaded... I'm not good in the genre challenges lol I don't do a certain style... so shabby chic is not easy for me! But then I came across the awesome image Federicka - Libby Carefree and that was the starting point!!!! I used the fabulous papers the set Classic hears paper and some from Rose Papers. I distress the entire card... used some vintage lace and I hope that I have achieved the Shabby chic look! She is coloured with my Graph'It Markers. The papers are from the Rose Papers Download Bundle. I have used a distressing tool to rough the edges of everything and then used the Tea Dye Distress Ink around the edges. The rolled roses are from the same papers then ink and glittered.